Hello wine lovers and happy wine Wednesday! How has your week been? Did you try a new wine over the weekend? My little family is preparing for our daughters 4th birthday on September 12…she is asking for a ‘Ballet Birthday Party’ and I am going about trying to make this happen. Mackenzie would live, eat and sleep in a ballet outfit if it were up to her. I love her passion and desire to dance, move and have an audience. As I promised last week, here are my ‘Speed Blogging’ notes I made during my rapid-fire session with the WHITE wine category. Again, we had 5 minutes with 10 wineries to taste, smell, listen and write down our notes. It is my sincere hope that the conference organizers keep this fantastic session going as it is one of my personal favourites. These notes are what I wrote down exactly as I was in the session with zero editing. I hope you enjoy it! Danza Del Sol Winery 2013 Vermentino Temecula Valley, CA stainless steel production 13.9% abv. salty/minerality…so awesome and crisp at $28. Super refreshing with amazing crisp citrus notes – would be fabulous with seafood! Ferrari – Carano – Fumé Blanc $14 retail 80,000 cases produced. Falls bit flat for me. Presenter says ‘spicy and seafood Friday ‘go to’ wine. Winery in business for 28 years. Needs more zip and more acid – just OK. Hard to hear this presenter. Too bad. Grassini Family Vineyards 2013 Sauvignon Blanc Santa Ynez Valley 100% estate grown. They reclaim and recycle all of their water. 13.5% abv. 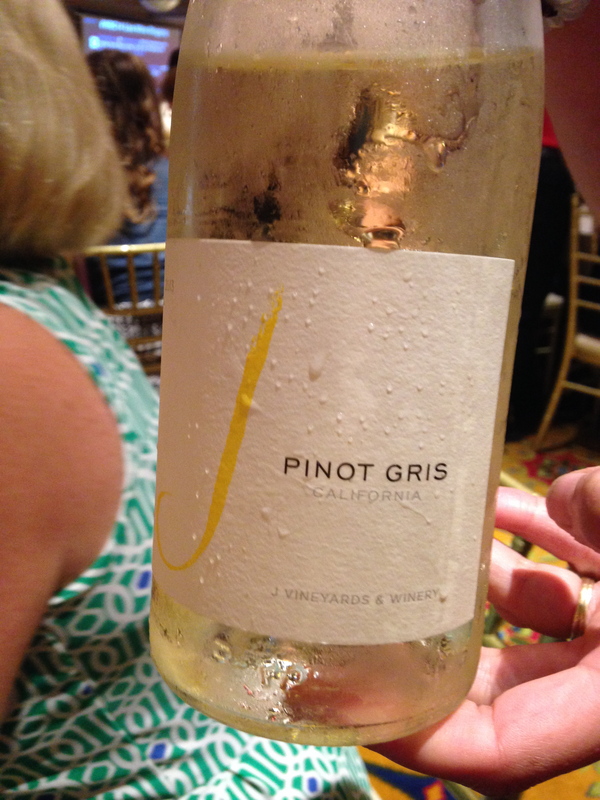 I like it…lots of lemon peel and a hint of minerality, a bit vegetal – thirst-quenching. Nice finish. Retails for $28. 500 cases produced of this SB. 2,500 cases total production. Nice. 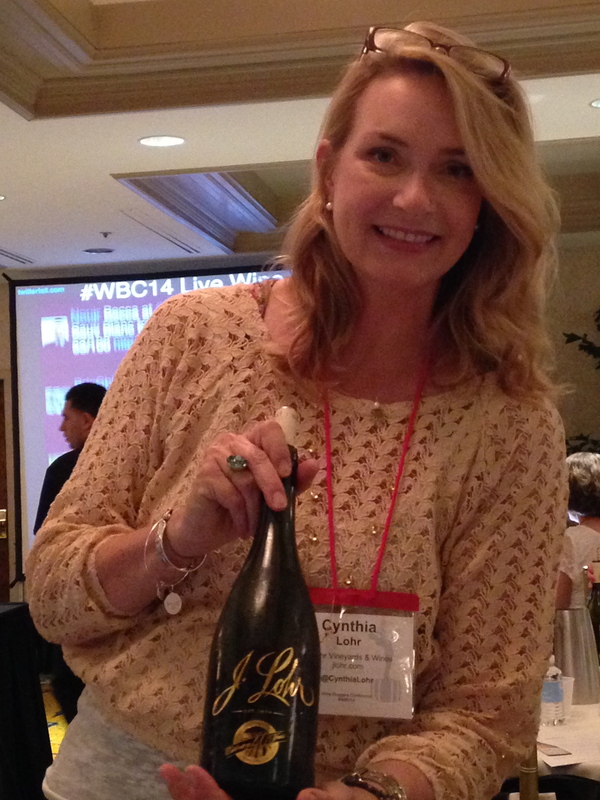 J Vineyards and Winery Joie de Gris Pinot Gris 2013 Female owned and operated #femalepower I love this wine! Retails between $12 – $16 a bottle. Women have more taste buds than men so we taste acid, fruit and tannin more accurately … what a great fact! Good balance. Lemon lime on the finish. Lets talk about the female palate! Wente Vineyards – Riva Ranch Chardonnay 2012 13.5 abv. 5 generations of winemakers. Same family. They were the first family to plant Chardonnay in California. Retails for $22. French and American oak barrels used. Tropical notes with vanilla. Hope Family Wines Treana White 2012 – Viognier and Marsanne blend. Gorgeous and big – maybe my favouirtie of the flight so far. Oily with stone fruit and honeysuckle. Nice acidity. Fab with ethnic food or fois gras. 14.5% abv. Paso Robles AVA $23 retail. Corner Stone Cellars 2011 Napa Valley Sauvignon Blanc. Craig Camp – winemaker. Sauvignon Blanc is a natural for Napa Valley. This guy is passionate about what he does and he is making me feel enthusiastic just listening to him! PH 3.3 super low. Brightness in the wine lives and lets you taste – opens up nicely. Refreshing. 2 vineyard Howell Mountain and one by the river. Putting all clusters in the mix and doesn’t de-stem. Old clones over 20 years old and organically farmed. 3 and 4 year old old French barrels $30 retail. Very nice. Aridus Wine Company Viognier – 2nd crush. Located in Tuscon, Arizona Vineyard 5,200 FT The wine is a bit flat. Hard to understand this presenter. Feel badly as she is trying but seems overwhelmed. I think they do 2 or 3 wines. New company. Some great presentations and some just plain boring presentations this session. I do love the ‘Speed Blogging’ sessions because I am forced to focus intently on what the presenter is saying and I need to use my wine tasting skills to do a personal assessment at the same time amidst a loud room and a lot of excitement – definitely gets the adrenaline going! Next week I am up to Penticton again for the BC VQA assessment panel for two days. I am looking forward to being alone in a little white booth for 3 hours assessing about 40 wines each day. My post next week may be a specific wine review or I may do an overview of the “Cabernet Collective’ event that I attended in Paso Robles…just amazing.